Scotland boss Andy Robinson admitted his side gave New Zealand a license to thrill in their clash at Murrayfield on Sunday. The Scots flirted with a first ever win over the All Blacks with a try from winger Tim Visser propelling them into an early lead but they eventually succumbed to a 55-21 defeat with the hosts left to rue their failure to shackle the world champions. A three-try salvo from the visitors in a 10-minute spell just before the break saw the game slip away from the Scots with Robinson adamant that they contributed to their own downfall. "If you sit off New Zealand they're a very good attacking team and they will take you apart," said Robinson, who confirmed flanker Ross Rennie suffered a dislocated shoulder in the first half. "That was a lesson that we knew before going into this game, that we had to get off the line, that we had to put them under pressure. We did in parts, but you've got to do that consistently for the whole 80 minutes. I thought we just dropped off a little bit on our line-speed and allowed them to play too comfortably." 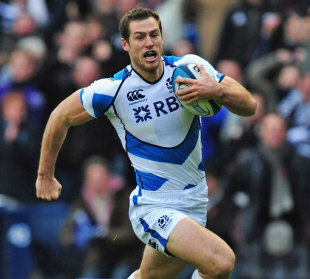 Scotland skipper Kelly Brown also admitted his side failed to rise to the challenge. "We needed to be a difficult side to beat and out there we weren't." The gutsy Scots would notch a second try courtesy of prop Geoff Cross before the break and Visser would double his tally in the second half but they never really pressured the All Blacks who notched six tries with Julian Savea (two), Israel Dagg, Corey Jane, Andrew Hore and Ben Smith all scoring. But it was fly-half Dan Carter who claimed the man of the match honour after a typically talismanic display. "When you give a guy like that time and space he'll pull the strings," said Robinson. "He's a fantastic footballer and rugby player. We had to put him under pressure. When he does break the line the team normally score from it." The All Blacks' delight may be tempered by a citing for flanker Adam Thomson who was yellow carded for some reckless rucking to the head of Scotland's Alasdair Strokosch. Citing commissioner Murray Whyte is set to review the tape but Strokosch was quick to play down the incident. Strokosch said: "It certainly wasn't malicious. There was no damage done. He barely grazed it. I would say the yellow card's fine. I wouldn't take it any further. It wasn't a big deal." New Zealand head coach Steve Hansen said: "It looked like he (Thomson) got frustrated because someone was lying over the ball. He placed his foot on the guy's head. He didn't stomp him, which was one good thing, but the rules say you can't, so I'm sure someone will be looking at it. "Someone will look at the game and they'll make a decision if what he did was with malicious intent or reckless. I suggest probably reckless and from there it will take its course. Apart from that incident I thought he played particularly well." Reflecting on his side's overall performance, Hansen said: "Our guys at times did some wonderful things and when we played well, we played well and scored good points."